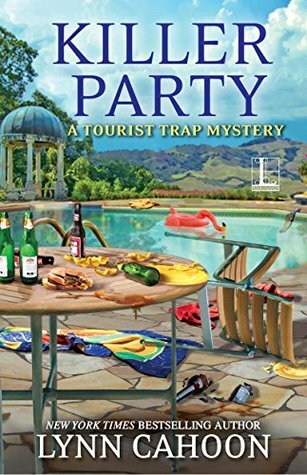 Killer Party ( A Tourist Trap Mystery #9) By Lynn Cahoon *RELEASE DAY* – Books, Books and More Books! This is the ninth book in Lynn’s Tourist Trap Series. With a weekend of luxury at The Castle, rented out by the groom, what more could a girl want? Especially when her hot cop boyfriend is part of the package. On the first day Jill senses something is off with this group of Greg’s old high school buddies and their wives. So when the groom turns up facedown in the pool, even Greg is on the sidelines. Jill’s suspect list is pretty long with everyone from the party as well as the new Russian Doll Shop owner. Who seems to know the bride-to-be. Lynn’s characters have come a long way from the first book. They are well-developed and very loveable. They have become like good book friends. I love Deek and while Aunt Jackie wasn’t my favorite character, this time I really felt her presence and there was a secondary mystery going on with her. Can’t wait for the next one, See you soon South Cove!